The highest-ranked US military officer has said speculation over the US withdrawal from Afghanistan could "encourage the enemy". 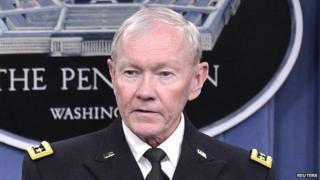 Gen Martin Dempsey said talk of a full withdrawal could lead Afghan forces to make "accommodations" with the Taliban. President Obama warned on Monday the US may pull all troops out of Afghanistan in 2014 if a bilateral security agreement (BSA) was not signed. Gen Dempsey said the impasse was "having an effect on the enemy and in some ways I think encourages them, and intelligence supports that". "There are parts of the country where it seems to be, there will - with some likelihood... be some accommodations between the Afghan security forces and the Taliban," he said. "I think a delay in the [security agreement] might accelerate those kind of accommodations. I don't think it will be widespread by the way, but we do have to be alert to that possibility." US troops have been in Afghanistan since 2001 when they helped oust the Taliban, but Washington wants to maintain a much smaller presence in the country after 2014. Speaking to reporters at Bagram airfield, Gen Dempsey said that Mr Obama's warning did not mean the US had already made the decision to completely withdraw troops. "What it is not is a fait accompli that we are going to zero", he said. He added that the latest a decision could be made on whether to go ahead with a full withdrawal was in the summer. Gen Dempsey told the Associated Press news agency that he expected the Taliban to become more aggressive during the summer fighting season. On Monday a White House spokesman said that President Barack Obama had asked the Pentagon to ensure it had "adequate plans in place to accomplish an orderly withdrawal by the end of the year should the United States not keep any troops in Afghanistan after 2014". "Furthermore, the longer we go without a BSA, the more likely it will be that any post-2014 US mission will be smaller in scale and ambition." the spokesman added. While Mr Karzai has refused to sign the BSA, some candidates in April's Afghan presidential elections have indicated they would. Mr Karzai, who has served two terms as Afghanistan's first and only president since the Taliban were ousted from power in 2001, is obliged by law to stand down after the next election. There are currently about 34,000 US troops in Afghanistan.